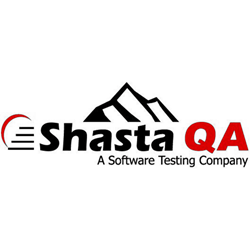 Shasta QA is celebrating its 15th anniversary of partnering with multi-billion-dollar and small startup tech firms to provide outsourced Silicon Valley-level software quality assurance services and testing from rural American facilities. Following its OurSourcing® philosophy since 2002, the company has partnered with more than 115 clients from New York City to Silicon Valley, generated 550 man-years of experience, boosted end-user satisfaction, and helped shepherd clients to IPOs, acquisitions, and hefty market shares. Shasta QA’s OurSourcing® philosophy relies on growing its own local, humble tech talent who’ve embraced small-town America’s quality of life and lower costs of living in Northern California, the Midwest, and South. Shasta QA’s staff are honed by deep training rooted in its proven methodologies, flexibility, and challenging peer review, to readily provide customized Silicon Valley-level software quality assurance solutions without Silicon Valley costs and overseas obstacles. Sharing client time zones, business norms, culture, and expectations, Shasta QA provides targeted expertise with manual, automated, and appropriate SDLC strategies, to build efficient, flexible, risk-reducing QA regimes and processes from the floor up. The company understands clients need for receiving real-world truths and metrics, and the risks of inaccurate feel-good overseas messages about their software products from thousands of miles away. Direct content editing and scrubbing. Medical devices and related software. Consumer web and mobile apps. Redding, Calif.-headquartered Shasta QA was founded in 2002 by Silicon Valley veteran Donald O’Connell, with a commitment to an OurSourcing® philosophy to create American tech jobs with onshore talent. Shasta QA has provided sophisticated outsource quality assurance business partnership services to short- and long-term clients across the U.S, from facilities in Northern California, the Midwest, and South.